For the 2,500 Nicaraguans with Temporary Protected Status (TPS) who have been residing in the United States since 1998, their humanity now has a deadline in the eyes of the Department of Homeland Security: January 5, 2019. The Acting Secretary of the Department of Homeland Security, Elaine Duke, announced this in a press release on November 6th. However, TPS for Hondurans has been extended by six months automatically because the Department of Homeland Security was not ready to make a decision about Honduras. 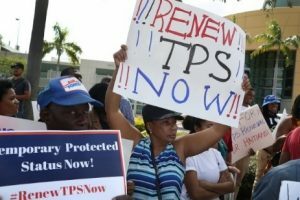 Decision deadlines for the larger groups of Haitians, Salvadorans, and Syrians are looming, and if they lose their TPS, they’ll be forced to return to uncertain conditions in their countries of origin. Temporary Protected Status is part of the Immigration Act of 1990 and allows the Secretary of Homeland Security to designate certain countries as eligible for TPS due to country conditions that prevent immigrants in the U.S. from returning to their country of origin. Examples of such situations include natural disasters, violent conflict, or other extraordinary situations. Once U.S. Citizenship and Immigration Services (USCIS) approves an individual for TPS, this status allows beneficiaries to obtain a work permit during the period of protection, but it does not provide a pathway to permanent resident status. In addition to Nicaragua and Honduras, the following countries have been designated for TPS: El Salvador, Haiti, Nepal, Somalia, Sudan, South Sudan, Syria, and Yemen. Immigrants who lose TPS must uproot their lives in a short period of time and leave behind careers, health insurance, degrees, and homes in the United States. If they don’t leave the country, they face the prospect of deportation if they are not eligible to secure other legal protections. The decision to end TPS for Nicaragua comes just months after the administration terminated the Deferred Action for Childhood Arrivals (DACA) program. These decisions put people’s lives in limbo as they grapple with the uncertainty and anxiety of whether their lives will be uprooted once again. People’s lives should not be put on the line for political power plays. The philosophy behind Temporary Protected Status, as with DACA, is inherently flawed because it makes a person’s humanity temporary in the eyes of the law. As Elie Weisel once said, “no human being is illegal.” Amending the law to provide TPS recipients more transition support and a pathway to permanent residence would be a step towards justice. How can faith communities respond to these troubling decisions and show solidarity for our immigrant family? Tell Congress to Support TPS Holders and #SaveTPS! Sample Script: “I’m your constituent from [City, State]. I stand in solidarity with my immigrant neighbors, support Temporary Protected Status (TPS), and strongly oppose any attempt to terminate or curtail the program. TPS is designed to protect people from being returned to harm and is extended based on country conditions. There are about 330,000 people from 10 different countries who through TPS are currently pursuing their dreams and raising families in safety. Some have been here for many years, and more than 70% have a U.S. citizen sibling, spouse, or child. Tearing apart families is wrong. The Church Council of Greater Seattle encourages you to demonstrate faith in action through advocacy. How can your congregation find ways to open its house of worship to offer hospitality and support to those with Temporary Protected Status? We must faithfully tell the government that in the eyes of God, no one’s status as a human being is ever temporary. E-mail Briana Brannan, our Immigrant and Refugee Accompaniment Organizer, if your congregation is interested in becoming involved in local response efforts. Paige Foreman is interning at the Church Council of Greater Seattle as part of her service year with the Seattle Service Corps at Saint Mark’s Episcopal Cathedral. She has a Certificate in Spirituality and Social Change from Pacific School of Religion, where she studied the intersection of interfaith work, social justice activism, and the arts.